First Fruits and Kwanzaa season starts next week! For the fourth consecutive year, First Community Interfaith Institute Inc. is participating in the online fundraising vehicle known as "ROCTHEDAY," where people from everywhere can donate securely to the Rochester based nonprofit(s) of their choice. This year "ROCTHEDAY" falls a little earlier than usual, on December 2. You have from midnight December 2 to 11:59 pm December 2 to use your credit or debit card to make a tax deductible donation to our educational programs here at the Institute. If you have benefited from the Institute's services in the past, we are hoping that this will be a good and easy way to give back. The direct link to our donation page is https://www.roctheday.org/FIRSTCOMMUNITYINTERFAITHINSTITUTEINC. First Fruits begins on Monday December 1. We at the Institute celebrate First Fruits from December 1 to December 25. From December 26 to January 1 we switch gears to celebrate Kwanzaa as popularized by Dr. Maulana Karenga. 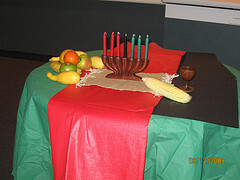 December 1 is the Kwanzaa Appreciation Program, 5:30 pm at 219 Hamilton Street. This is the introductory event that explains what Kwanzaa and First Fruits is all about. We conclude with the children blowing the seven candles. December 15 is African Mothers Day, 6 pm, School #33, 500 Webster Avenue. This is when all girls and women receive flowers from the men and boys. We also have dinner and a brief program coordinated by longtime Institute supporter Ester Gliwinski. January 1, 2015 is Imani (faith), 6 pm, St John's Home, 150 Highland Avenue. This is the Karamu, or Kwanzaa feast, where we exchange gifts, the children receive books, and we bring a dish to pass (no pork). We conclude the 32 day Kwanzaa season with the chant "HARAMBEE!" Hope to see you at our First Fruits/Kwanzaa events!